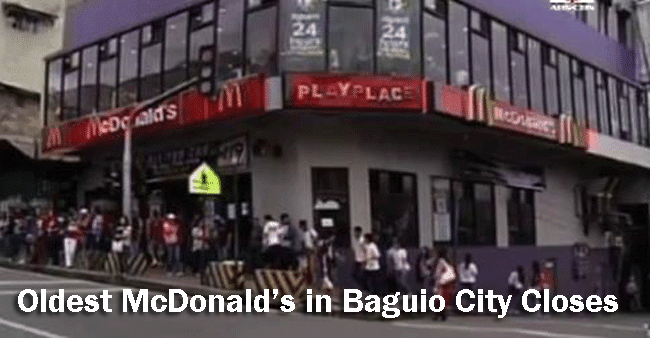 Baguio City, Philippines – After more than two decades of bringing joy to the people of Baguio City, the very first Mc Donald’s fast food chain will close. This fast food chain is well known in the city and in fact became part of Session Road for so many years. Those who have been there since the humble beginning of the said Mc Donald’s branch reminisce their good memories with it. There are only six days left before the closing of the very first fast food chain in Baguio City that was built in 1991. The reason for its closing is that its contract has already expired on the building where it is leasing. Since there are only a few more days remaining before the official closing of the said fast food chain, people are rushing in to remember the good old days. There were couples who had their first date on the place and they are married already. There were people who met each other on the said branch of Mc Donald’s, this is according to the story of a mother about her son. And there was this old man who made the branch his hangout for 12 years. On the second floor of the Mc Donald’s building lies the memory wall where all the memories were written and posted by people who considered the place special. With so many people who posted on it, there is no space left for those who would like to try also.